Developers most often looks for the tutorials on the topic Spring MVC using Hibernate as it is the latest java web framework. As it is a simple to understand it needs less time to write an application but the sad part is that we spend most of the time in searching for the right tutorial. This tutorial is to help such seekers and to save their valuable time. In java application development , Spring and hibernate integration is one of the most-perfect combination to develop the enterprise applications in java. Spring is the leading enterprise application framework and Hibernate is the leading ORM framework. So combination of these technologies would result in robust and reliable web application. This is the step by step tutorial in which we will learn the workflow of the Spring MVC framework and How to write a simple web application to perform the CRUD operations ? Spring Model is responsible for handling business logic. Most often the model is nothing but a POJO class. View is responsible for UI part. Controller will handle the communication between Model and View class. Controller is responsible for creating and getting output from model class and rendering this to View to display into the browser. This is the first step to handle the incoming request. Dispatcher servlet first search for the right handler class by mapping the URL. 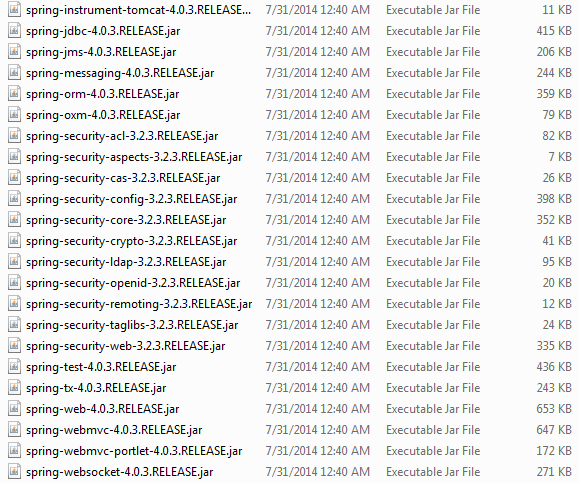 Note : Please make sure that you have defined the base package using the tag "<base-scan>" in deployment descriptor. Dispatcher servlet will looks only into this package for the appropriate handler class. The Controller takes the incoming request and calls the appropriate service methods depends on GET or POST method and executes the business logic. Controller is responsible to return the view name to dispatcher servlet. Note : Controller uses ModelAndView class to return the specific view. This class internally uses ViewResolver bean which we have defined in the dispatcher servlet configuration file to find out the view page. Dispatcher servlet take help of ViewResolver bean which is configured in the dispatcher servlet's configuration file. View Resolver will look for the specified view page either at the default location or at the custom location as configured in the configuration file. 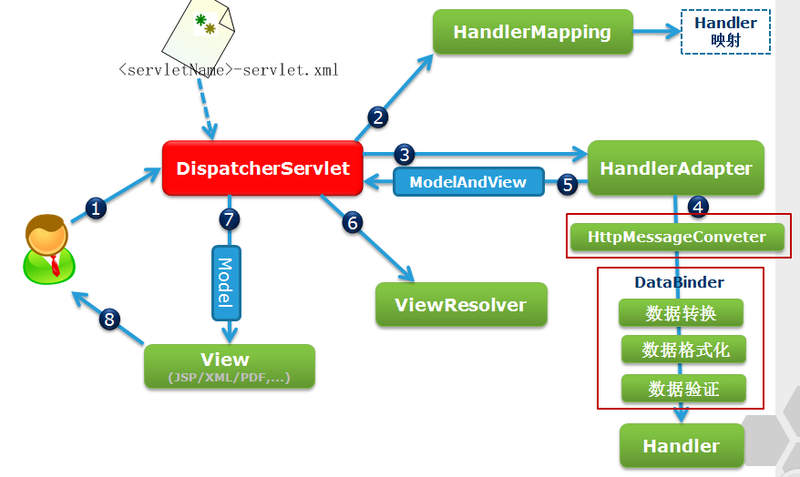 Once view is finalized, dispatcher servlet rendered the model data to the view to display it in the browser. In this application we need following jars. 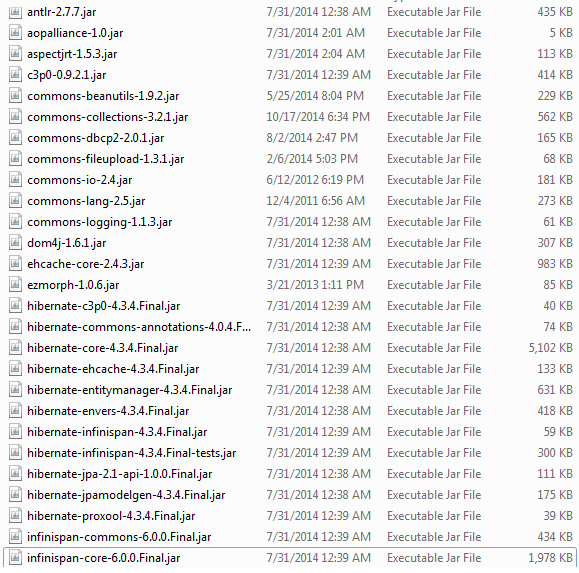 Please download it and paste them into "WebContent/WEB-INF/lib" folder. 1) Different tables in MySQL database. 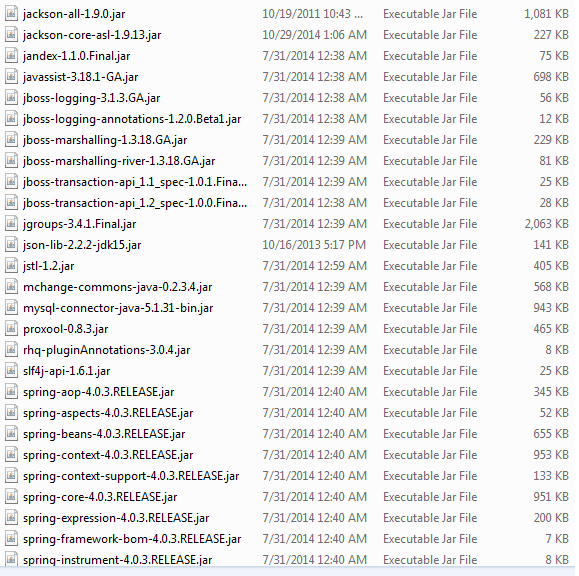 2) Deployment Descriptor and Spring Configuration file. 3) DAO, Domain, Dto and Service Classes. 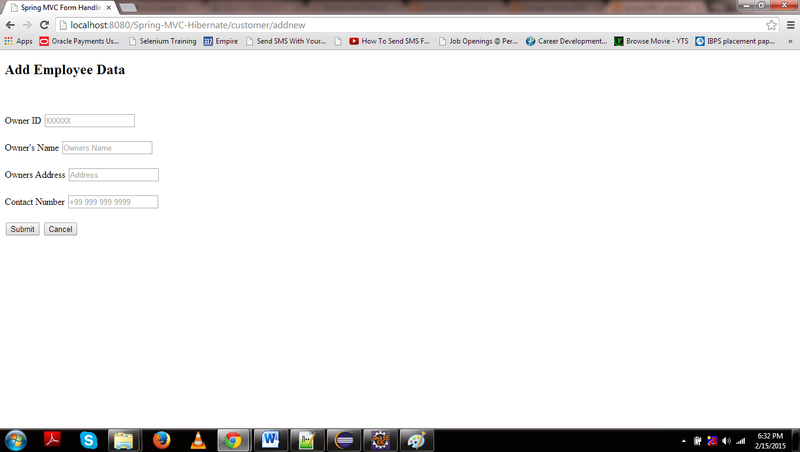 First To configure the web application context and dispatcher servlet we need to define web.xml. In above example, after initialization of web.xml the dispatcher servlet will try to load the application context from the mvc-dispatcher-servlet.xml in which we have configured datasource bean for jdbc connection, secondly hibernate session factory is beaing configured and ViewResolver bean is being added to render the corresponding jsp's. Datasource bean defines the jdbc properties like username, password, database URL etc.These properties should be declared in jdbc.properties file and should keep this file in WebContent/WEB-INF folder.Then we have configured the bean ViewResolver by using which Dispatcher servlet will be able to know where the jsp pages are. Dispatcher servlet use the session factory bean to configure hibernate related properties. Now we have to define an entity class using jpa annotations which would mapped to table cb_owner_master in database. Here to simplify the things we will define separate Dto classes ,the objects of these classes will be rendered to jsp pages and not of the entity class object. This will help us to customize the things that we need to display as we will have seprate classes which are mapped to database table and which are displayed in jsp pages. Now to perform the hibernate operations like save, update, delete etc. we will define DAO classes. Instead of defining common operations for each class we have defined them in GenericDao class. If tomorrow you need to define Employee class then you do not need to define all those operations again you can use GenericDao class directly into the Employee class. If you want to define customer related specific operations then you are free to define them in CbOwnerMaster class. Now our Dao, Dto and Domain classes are ready and we should go for the service classes which will use those to perform the CRUD operations. The next step is to define the controller class which will map the incoming http requests and return the corresponding view page. The last part of our application is to define the jsp pages which are responsible for look and feel of our application. 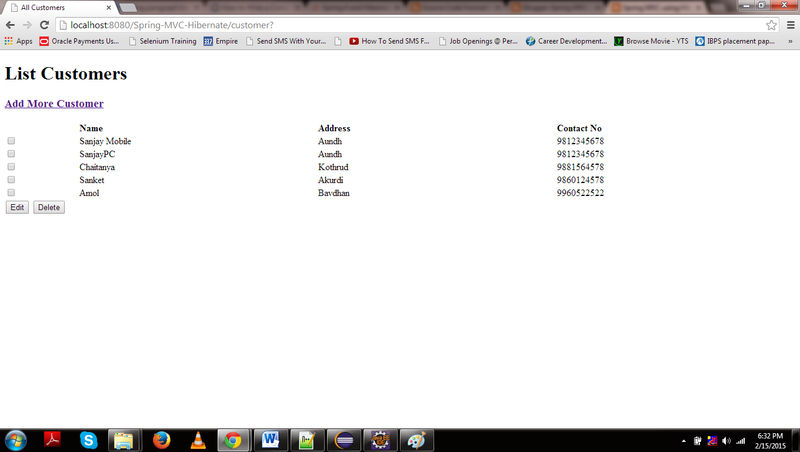 To dispaly the list of customers we have define the CustomerList.jsp which also gives the option for CRUD operations. 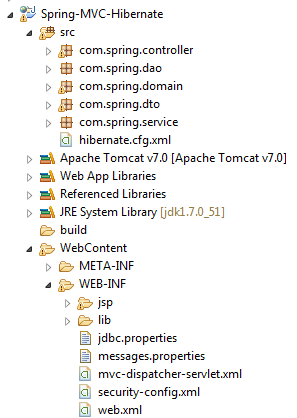 Once you are done with creating source and configuration files, export your application and use Export -> WAR File option and save your Spring-MVC-Hibernate.war file in tomcat's webapp folder. To login into the application you need to insert user in cb_users_master and cb_user_roles with same username and role as ROLE_ADMIN. customers Now start your tomcat server and make sure you are able to access other web pages from webapp folder using a standard browser. Now try a URL http://localhost:8080/Spring-MVC-Hibernate/login and you should see the following resultif everything is fine.